I’m excited to announce the next installment of my Fireside Chat series (via SKYPE) with guitarist David Tanenbaum. 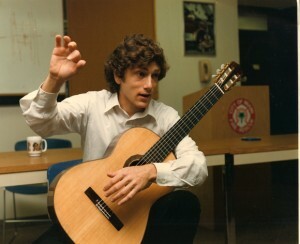 As a recording artist, concert artist, arranger and educator, David is one of the most important guitarists of the day. His contribution to the guitar’s repertoire through commissions are unparalleled as evidenced by his recordings (over 25) featuring newly commissioned works by composers such as Steve Reich, Terry Riley, Hans Werner Henze, etc. I remember my first encounter with David as an entering freshman at the San Francisco Conservatory of Music (where he now teaches). I was gleefully pouring over the college catalogue and looked up to see David Tanenbaum walking through the halls. It is hard to describe the excitement I felt. While I’m no slouch, there are certainly a few players that I still marvel at – David is one of those players. I have a hard time relating to him; he devours new repertoire with amazing reading skills, performs in some of the most high pressured situations with unerring composure (one story had him actually playing for the German composer Henze from the backseat of the composer’s Porsche while flying down the German Autobahn). He approaches his music with an incredible high intellect, producing music that simply sparkles. Here’s a fun video of David with Manuel Barrueco, Sergio and Adair Assad and David Russell at Barrueco’s guitar party. Although his recordings consist mostly of modern works, David is a great interpreter of the music of the Baroque. 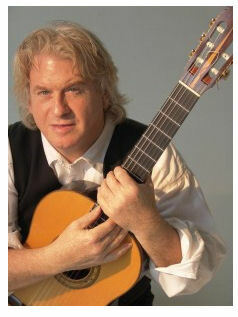 One project I remember him doing back in our SFCM days was scouring over the entire 550 Domenico Scarlatti Sonatas, arranging many of them for the classical guitar. Here’s a recording of David playing Scarlatti Sonata K336. Mark your calendars for Saturday, May 12th from 2:00-3:30 pm PDT and contact me directly to reserve your spot. A limited number of SKYPE users will be permitted. You should update your SKYPE account and send me your SKYPE username if I don’t already have you in the system! 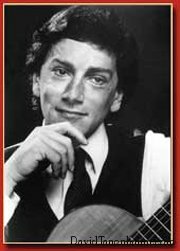 This entry was posted in Classical Guitar History, Guitar Tips and tagged classical guitar, david russell, david tanenbaum, guitar, manuel barrueco, sergio and odair assad. Bookmark the permalink.